With gaming becoming more and more popular, the gaming industry is advancing faster than ever. Many gaming enthusiasts will research and invest in the best and latest gaming accessories. Consoles, monitors, keyboards, and joysticks all upgrade the gaming experience to the next level. It’s been around since the early 2000’s, but more recently, there has been some serious advancements and demand for the gaming chair. It’s hard to believe how much a piece of furniture can actually impact the gaming experience. Sitting with poor posture for long periods of time can eventually lead to health problems. Sitting in really isn’t so great for the body in general. In fact, it can hinder the flow of blood to the lower body and put unnecessary pressure on your muscles and joints. Gaming chairs are specially designed to help with all of these problems. The best chairs will have an ergonomic design that takes strain and pressure off of areas in the back and neck. It can also improve circulation of blood throughout the body. Adjustable height and neck/head support also help to protect your neck and upper back from injury and discomfort. Just the fact of improved comfort will help you perform better. Not having to pause and readjust or stretch as often will save you time and cause fewer interruptions. You can sit for much longer and further develop your skills. 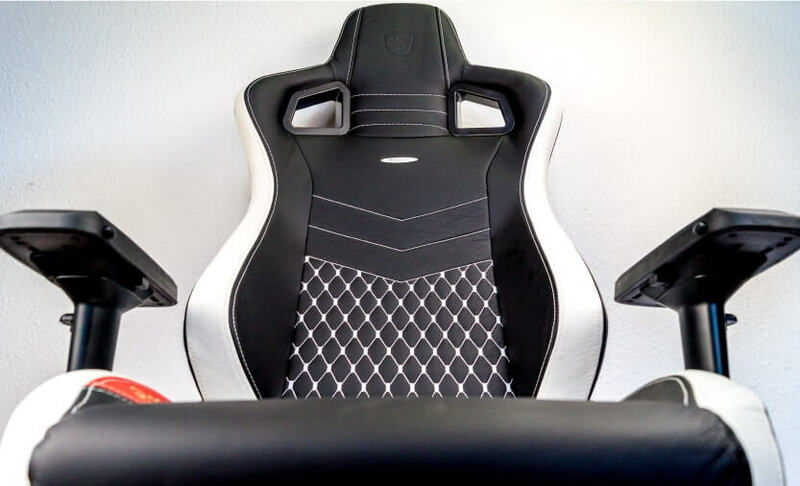 Another way that gaming chairs can help improve your gaming performance is that you can actually purchase specific types of chairs for specific types of games. Getting a chair specific to the types of games you prefer can greatly improve the way you interact with the games by offering better controls. Also, improved positioning of controls allow for more comfort and dynamic range of motion while operating them. Gaming can really put a strain your eyes, causing headaches and impaired vision. Gaming chairs allow you to adjust the height and angle of the chair to line up your eyes directly with the screen. This is especially important when using a large or multiple display monitors. It’s also helpful that most gaming chairs are easy to move around, so you can move closer or further away from the screen as needed. Your simple office goes up and down, and that’s probably about it. Gaming chairs can be completely customized to your body and preferences. Adjust everything from height, angle, where you need lumbar support, and even the angles of the armrests. You can remove and add parts as you desire. Some chairs even allow you to adjust the rock, rotation, and swivel. If you’re spending hours a day in one spot, over time it usually starts to wear down. Gaming chairs are designed to be strong and sturdy for much longer than average chairs. A good gaming chair can be a part of your life for a very long time. Top of the line metals, cushions and upholstery provides you with lasting support for years, without wear and tear. Even for the most intense, competitive gamers. You’re most focused when you’re most comfortable. Sitting and playing for hours on end on a couch or average office chair are sure to eventually cause aches, pains and even numbness. At some point the only way to find relief is going to be to get up and walk around, stretch, or move to another seat completely. There are plenty of other things around you to be distracted by. Don’t let your discomfort be one of them. It’s worth mentioning a hundred times. If nothing else, ultimate comfort is the reason to invest in a gaming chair. Sitting uncomfortably can make coming out of an hours long gaming session feel even longer than it actually was – and not in a good way. Gaming chairs offer customized comfort. Once you get all the little adjustments set to your specific preferences, it’ll be like no chair you’ve ever sat in before. You’ll actually be able to feel the difference even after you get up. Proper cushioning and support is provided in every perfect spot. As mentioned above, genuine comfort can mean increased focus and concentration and improved performance. Besides better performance in gaming sessions and optimal comfort, gaming chairs can protect your health and wellbeing for years to come. They can help reduce eye strain, improve blood circulation and support joints and muscles. If you’re already spending the time and money to invest in gaming gear, go ahead and start looking for a gaming chair as well. Even if you’re just a casual gamer who experiences the occasional aches and pains of poor posture and seating, you’d still benefit from one. It’s worth it for your gaming experience, comfort and overall health.